Examples, solutions and lessons to help High School students learn how to write a function that describes a relationship between two quantities. 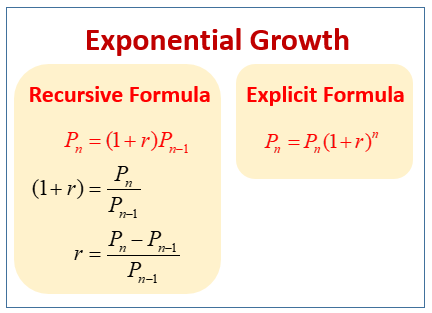 The following diagram shows the recursive formula and explicit formula for exponential growth. Scroll down the page for more examples and solutions on exponential growth. Common Core State Standard F-BF.1. Explanation of Recursive equations and Explicit Equations. Recursive functions are functions that repeat a process on successive values to generate the next value. The next number in a sequence is found by performing the operation on the current number in the sequence. Give the recursive and the explicit equation to represent the situation. Bobby shares a Youtube video with three of his friends on Facebook. Within 1 minute each of those friends share the video with three of their friends. How many people received the video during the 10th minute? This video explains how to express exponential growth using recursive and explicit equations. There are 4,000 students attending a local community college and the number of students is increasing by 5% each year. How many students will attend the college in 4 years? This video explains how to express exponential growth in recursive form and in explicit form. An ant colony is growing according to an exponential growth model with P0 = 80 and P1 = 92 where n is the of days. 1. Find the recursive formula for the growth. 2. Find the explicit formula for the growth. 3. Determine the population after 30 days. 4. Graphically determine when the population will reach 990. This video provides an example of how to find a recursive and explicit equation for exponential growth given two function values. A population growth according to an exponential growth model P0 = 10 and P1 = 98.